Good morning everyone and good news to all Whatsapp users as your favorite cross-platform messaging app Whatsapp introduces push-to-talk feature on their app. Whatsapp messenger has been updated with a significant feature which lets you send and receive a voice note to/from a friend. According to Jan Koum, the CEO and co-founder of Whatsapp the Whatsapp push-to-talk feature is simple and different from the type found on other app. You do not have to tap through a variety of settings or menus to access this new feature, you will notice a little microphone icon close to your chat box, simply pressing and holding it while recording and releasing the push sends the voice message to the designated recipient, and swiping to the left delete the recorded message if you do not want to send it anymore. This is not a live two-way voice conversation feature, you only record a voice message and send it to your friend and if your friend decided to reply you he/she can record as well and send to you. This feature has been enabled in all versions of the Whatsapp app on all platforms – Android, iOS, Windows Phone, Blackberry and Symbian, allowing all Whatsapp users to exchange voice messages easily. 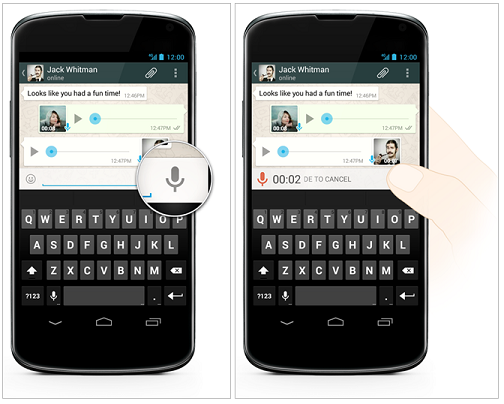 There is no extra cost for using Whatsapp push-to-talk feature. There is no limitation to how long you can record a voice message using the Whatsapp push-to-talk feature, so users can record and send voice messages however long they feel is necessary. If you have not seen the push-to-talk feature on your Whatsapp application, don’t worry as it will be made available to all users within the next 24 hours. I personally think the Whatsapp push-to-talk feature is great and I foresee it replacing the common text messaging. Text messages have been great over the years but Whatsapp push-to-talk voice feature is going to be even awesome as you can now hear the voice of your friends any time at no extra cost. It is not surprising that Whatsapp has decided to add this new feature in a season we are all expecting the BBM for Android/iOS to be released. Now the mobile instant messaging war has started and I can’t wait to see how both apps (Whatsapp & multi-platform BBM) competes. What do you think of the Whatsapp push-to-talk feature? Have you seen this feature yet on your phone? Have you used it yet? What was your experience with it? Share with me using the comment section below. Remember to subscribe to my RSS feed while you are on it. I can’t live without Watssap. Now it became even more convenient. if you need to tell smth really quickly and have no time for typing and don’t want to call or text abroad you just rec what you want to say)) Cool! I am already exploiting this new feature….its so cool, one do not have to type always. Whatsapp promised to make it available for all within the next 24hrs. It has made whatsapp more powerful and better .I would be checking this feature out man ..I’m excited to check out this feature ..thanks for making us aware of this mate ! First time I have heard of this feature Nwosu but it seems revolutionary in its own right! I mean, we want fast, quick and convenient. I am no fan of texting; too slow, and my fingers hurt from typing on my laptop all day long LOL! So this would be up my alley. This feature will definitely make Whatsapp one of my mobile messaging app. Glad am not the only one that feels its a great addition. Whatsapp is like a soul of android users and this new feature is really great for all of them. It’s amazing to see WhatsApp growing at such an incredible rate. Thanks for sharing this post with the BizSugar community. Tell me if you can, from your perspective, is this tool poised to become important to small businesses and entrepreneurs…or is it already? Whatsapp already is a great tool for small business and entreprenuers as most of them cut cost using this app and just like you know traditional messaging is almost dead since the birth of the social media. Small business owners can use Whatsapp as a tool for promoting their business and brands by maintaining relationships with their clients while saving cost. This new feature can even allow them share audio notes with their contacts even if they do not want to call them. I love whatsapp the more everyday, move convenient for me always. I can’t just wait to start exploiting this feature on my whatsapp. You will definitely find it very attractive and useful.